LOVE green. About the same amount I love coffee or dark chocolate. Too bad those aren't green. But they're brown, and brown goes well with green so it's okay. 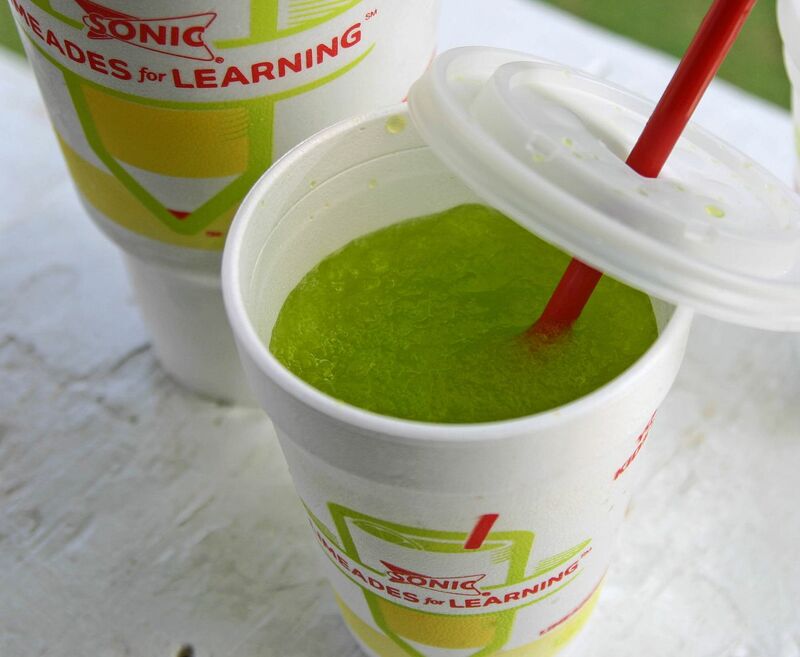 About once a week or so we go to Sonic for a Happy Hour slush. My kids decided a few months ago that they wanted green slushes, but Sonic doesn't offer one. So we came up with the perfect way to order one. You order a slush with Orange and Blue Powerade. My kids call it a Shrek slush. And they're hooked on it. I order a Rt. 44 Diet Coke with extra cherry. Mommy caffeine plus kids' green slushes equals a very happy hour. I will remember this for our next Sonic trip, my daughter LOVES slushes! And Shrek! you are one horny family! We JUST got a Sonic in the town I grew up in about two months ago. It STILL is lined up out on the street and it's ALWAYS jam packed! I love those slushies and a Dr. Pepper with cherry....yummo! Sounds like you just did a sonic commercial! HAHA I will have to tell my kids about the shrek slush. excuse me while i CRY... we don't have a SONIC! have you ever heard of such a crazy thing! btw... have i told you lately... you're the best! sure know how to make people smile! Green is my favorite color, too! And, you add a bit of slushy on top of that.... you've got a delicious combo! Thanks a lot...now I'm going to have to go there this afternoon. Cherry vanilla Dr. Pepper for me...or cherry limeade...or lemon-berry slush. Can hardly go wrong. Except the mango flavor. Sarah above here, I know you said you like it. But, oh my. I thought it tasted a little like B.O. Not that I've ever tried B.O. But you know how things taste like they smell...hope I don't ruin it for you. Wow. I am wordy today. Green is my favorite color also! I too love love love dark chocolate! Are we long lost sisters??? Hi - I came over from the Benner Daily Blog where you are giving away the great necklace! They finally put in a Sonic 'near' me. It's about 45 minutes away. I've never had Sonic, yet I crave it regularly. Stupid Sonic. Hillarious! Our kids LOVE Sonic...only it's 30 minutes away, so we don't get there very often...but we will remember this!! I totally agree with the coffee and dark chocolate. My daughter loves slushes and my son loves green. We haven't tried the green slushes, will have to though. Great idea. First time on your blog. Love your stuff and take on life. By the way, are you in the Springfield area???? I noticed Lamberts and SDC in earlier posts. I live in Nixa. Cool to know you may be close. Neat stuff. Have a great day!!!!! I love Sonic Happy Hour! That is one great deal-two kid's slushes for $1. Nice! Just found your blog thanks to the Benner Daily. I love your jewelry and now your blog. I look forward to seeing what else you have to say! i love sonic happy hour! Yummy photo! I have no idea what Sonic is, but I'm sure I would love to go in! delicious! Oh I could go for a RT.44 diet coke about now! Hi treats, love this post. Your whole blog is just fab. Ta ! Hmmm, our's doesn't have green apple. I'd love that though!